Backyard ponds are harboring animals dangerous to Arizona’s wildlife. Bullfrogs and crayfish are not native to Arizona’s waters. Bullfrogs are voracious predators that eat any animal they can cram into their large mouths. Crayfish will eat any organism they can catch and will strip a stream of its aquatic plants, turning a clear stream into a muddy slough. Both reproduce prolifically and both have escaped from backyard ponds into natural riparian areas threatening wildlife and destroying habitat. Bullfrogs eat native wildlife like birds, small mammals, dragonflies, butterflies, lizards, frogs, turtles and fish. Bullfrogs reproduce prolifically. Just one female can produce thousands of young per year. Bullfrogs spread to neighboring wetlands and gardens. Bullfrogs can travel 8 miles in one season seeking new habitats. Bullfrogs, unlike our native leopard frogs, have a loud call that can disrupt your neighbor’s sleep at night. Crayfish, also known as crawdads, eat aquatic plant and animal life, including lily pads, irises, tadpoles, frogs, baby turtles, and fish. Crayfish cloud water by destroying the plants that filter and oxygenate water. Crayfish erode edges of ponds by digging tunnels and uprooting plants. As more southern Arizonans build homes closer to natural wetlands and mountain canyons, these pests are escaping from garden ponds and golf course lakes and spreading to wild areas. Once these animals are established, it is very difficult and expensive to remove them from natural wetlands. Introduced species disrupt the delicate balance of life. 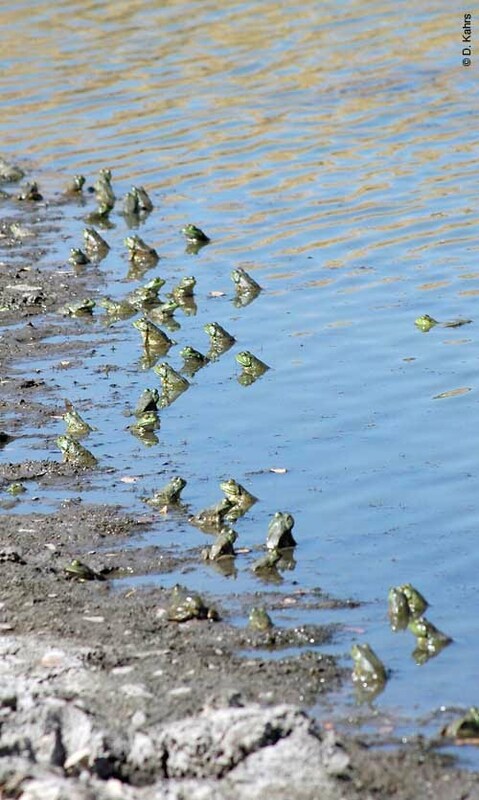 Many species of Arizona’s native frogs are in danger of extinction. Native predators, like the black hawk, rely on abundant populations of leopard frogs as a regular food source. Crayfish kill small leopard frogs, tadpoles and eggs, while bullfrogs eat the adults and spread devastating frog diseases. This, in combination with widely introduced non-native fish and loss of aquatic habitat has wiped out most populations of leopard frogs in Arizona. Gone are the days of seeing thousands of leopard frogs hopping from the banks of our streams and lakes. Its illegal to import, sell, purchase, transport and release live bullfrogs or crayfish in Arizona, except as authorized by the State (Report violations to Operation Game Thief 1-800-352-0700). You can legally harvest unlimited numbers of bullfrogs and crayfish with a valid Arizona fishing license, but they cannot be kept alive. If you have a pond or water garden, and don’t have bullfrogs, bullfrog tadpoles, and/or crayﬁsh, take precautions to keep them out. If you fear a neighbor might be less cautious, you can install a smooth-surfaced three to four foot garden wall as a barrier to keep out unwanted pests. If you already have bullfrogs, bullfrog tadpoles and/or crayﬁsh, take appropriate measures to eliminate them before they can do any damage. Small ponds should be drained, letting the liner dry out completely to ensure that any pests have been eliminated. This might take as long as 3 weeks. Do this during the summer dry season (May-June) to reduce the likelihood of these animals relocating in your neighbor’s yard or a nearby natural area. You should also transplant your water plants, as crayﬁsh often burrow into water plant containers. You can call the Arizona Game & Fish Department or the University of Arizona to speak with an expert (the phone numbers are listed below). 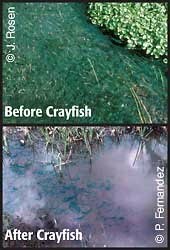 Bullfrog and crayfish eradication is of great concern and state biologists might be able to help you evaluate the undertaking. Help spread the word among other water gardeners and water garden retailers. Most bullfrogs and crayfish come into the state unintentionally with shipments of water plants and fish. Some animals are sold or given away as pets, others stowaway on water plants when moved from one pond to another. Bullfrogs attack and eat anything their size or smaller making many important watering holes death traps to insects, birds, small mammals, reptiles and amphibians. 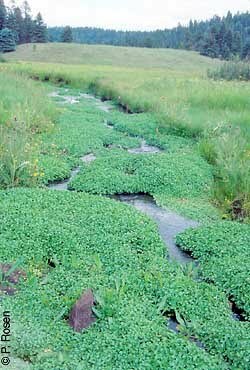 A stream in northern Arizona before an unsuspecting ﬁsherman dumped in his bait bucket of crayﬁsh. Two years later, hungry crayﬁsh have denuded the stream of vegetation and clouded the water. Efforts have been underway since 1995 to remove the crayﬁsh, but the task is proving to be impossible.